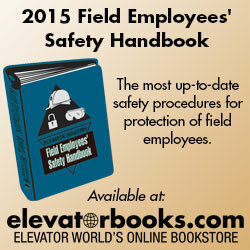 The entire Elevator Industry Field Employees' Safety Handbook is available here in PDF format. This copy is useful for searching for specific references or identifying chapters to focus on. It is presented as a management tool and does not replace the need for every field employee to study and carry the blue hardback edition available from Safety Section of the Elevator World Online Store. 2015 Field Employees' Safety Handbook (Effective 7/06/15). Black revisions, Full handbook. Download the full handbook with the latest revisions in red (released 7/06/2015). Full Handbook, red revisions. 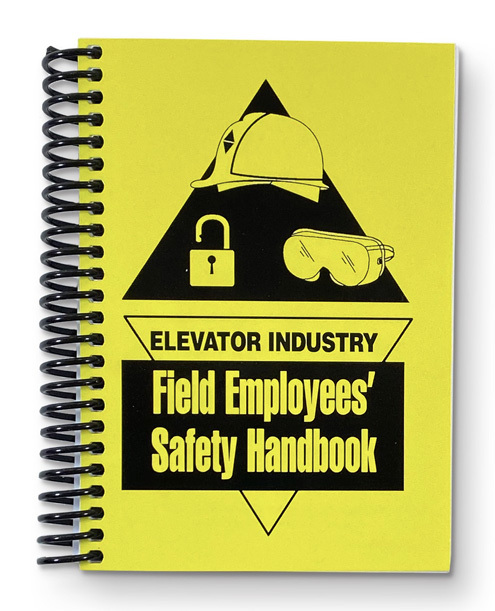 The Elevator Industry Field Employees' Safety Handbook is subject to ongoing review by the NEII® Field Employee Safety Committee, to clarify, update and modify the contents, in line with current industry practices and applicable regulations. In the past revisions were held until sufficient material was available to justify the cost of publishing a supplement. As the Elevator Industry Field Employees' Safety Handbook is now published on the web, it has been determined that revisions can be published electronically as soon as they are approved. Printed supplements will also be published periodically. The NEII® Field Employee Safety Committee recommends that employers check this site periodically. When a revision is posted copies of revisions should be printed and given to all field employees. Revisions should be implemented immediately after they have been distributed.